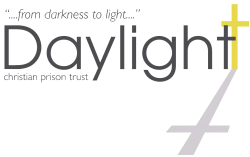 Daylight exists to share the good news of Jesus Christ with prisoners and ex-offenders across the UK, to support prisoners during their sentence and to provide practical post-release support to ex-offenders as they reintegrate into a local community to break the cycle of reoffending. We work in partnership with prison chaplains to run Bible studies, discussion groups and chapel services, so that more prisoners hear the Gospel. We work prisons across the UK and have contact with many prisoners and ex-offenders each year. Daylight’s regional Prayer and Support Groups provide ongoing practical support to ex-offenders after release. They can meet ex-offenders at the prison gate, help them access local services for housing, addiction, employment, education and family support, and can help them attend appointments with these providers. The support group is a vital help during the first few months after release, which helps reduce the likelihood of reoffending and supports an individual as they settle into a local community. You can help Daylight support thousands of prisoners and ex-offenders for years to come by considering leaving a gift in your will to our work. Once you have ensured that your family and close friends are provided for, you have the opportunity to make a lasting difference for what you feel is important. You can leave different kinds of gifts in your will: a specified sum of money; a proportion of your estate; or a particular item or gift (i.e. shares). For more information on how to leave a gift in your will to Daylight, contact your solicitor or the Daylight office. Be part of bringing change from the inside out!